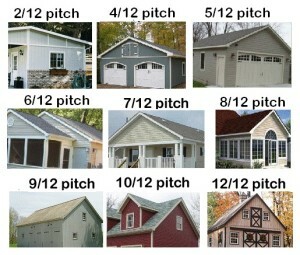 Home > News > What Factors Make A Roof Cost More? 02 Mar What Factors Make A Roof Cost More? Just like our great clients, no two roofs are quite alike. There will always be things that are a little different about each individual job. But let’s dive into what you really want to know which is: what are the differences that will lead to a higher roof cost. The biggest factor, of course, is the size of the roof. Bigger roof, more materials and labour required, higher price. The next biggest factor is the pitch of the roof. This can play a pretty significant factor and can drive up the price anywhere from $25-$100/square (100 square feet) depending on how steep the roof is. The average residential roof is anywhere from 15 squares on the small end to 30 squares on the large end. Essentially, any roof that requires a crew to pull out jacks and planks (pictured below) is going to cost more. 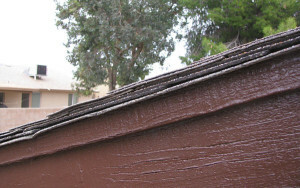 Another factor to watch out for is any house with multiple layers of shingles already installed. I’ve seen anywhere from 2 layers of asphalt shingles (not the end of the world) to 5 layers of asphalt shingles over 1 layer of cedar shake (rare, but an absolute nightmare)! People started smartening up in the 80’s though, so even double layers aren’t very common anymore. 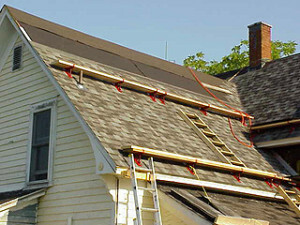 Multiple layers of shingles were installed on this house. The materials you select can also play a big role in the final price of the roof. The key here is striking the right balance between quality and price. While there are cheaper manufacturers out there, we stand behind GAF as our preferred manufacturer. There are too many stories like this one regarding IKO for us to consider taking the risk on their cheaper but inferior products. Hi Nevea, maybe I didn’t do a good enough job explaining it! That diagram represents the different levels of slope on a roof from low slope (2/12) to steep slope (12/12). Thanks for your comment! I hope that answered your question.